Hugo Lloris is bracing himself to face "one of the best players in history" in Lionel Messi on Tuesday and believes the only way Tottenham can stop the Barcelona talisman is by sticking together. Spurs going into their final Champions League Group B game at Camp Nou needing to at least match Inter's result versus PSV in order to secure progression to the last 16. 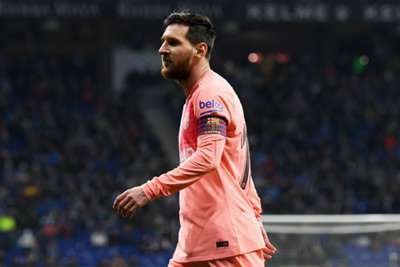 Barca coach Ernesto Valverde has assured Inter his team will be doing everything they can to beat Spurs, with Messi unlikely to be left in reserve. Lloris is preparing himself mentally to play the Argentine superstar, who has scored three goals in his last three games and struck twice in Barca's 4-2 win at Wembley in October. Time to get to work at the Nou Camp! "You're facing one of the best players in history," Lloris said of Messi to reporters. "It will not be easy, but we will go out with 100 per cent belief that we can do it. "It will be very tough to stop someone like Lionel Messi, but we will only do it as a team. "If you watch the free-kicks [he scored against Espanyol on Saturday] there is nothing you can do. When they go in the top corner like the other night, he's the type of player who can change the game and decide. "It's very difficult to face a player like him. The only way to do it is as a team, not give him too much space and be at our best defensively."